Are you interested in going solar in your new house? That’s a great idea for many reasons—financial, environmental and personal ones. Electricity bills are no joke, global warming is seriously taking a toll on our environment and property market is constantly struggling. All of these major issues of being a new homeowner can be (partially) solved with solar energy. 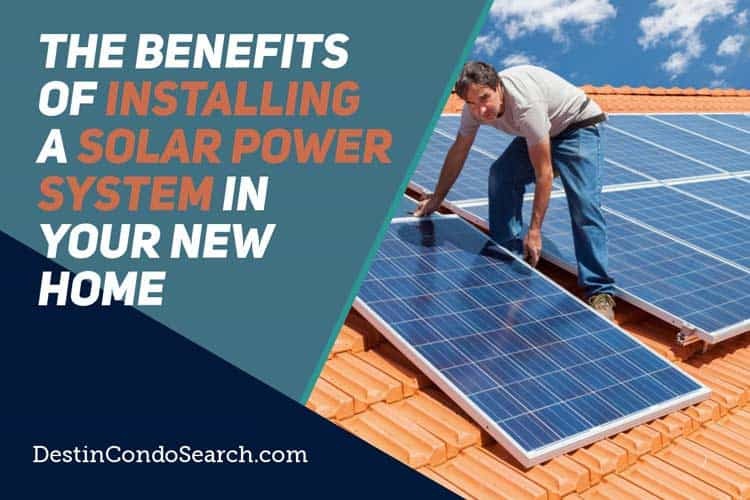 But, if you’re still unsure about this investment, take a look at this sizable list of all the benefits solar power systems bring to you and everyone around you. According to the recentanalysis, modern and eco-conscious home buyers are willing to pay a good price for a home that’s equipped with an average-sized solar system. Many future homeowners want to minimize their carbon footprint and live a green life, so a property that’s already equipped with a green addition will definitely attract eco-savvy buyers. Solar panel systems are and will continue to be a smart investment for yourhome in every way, even if you decide to sell it one day. Did you know that a single solarpanel system can counterbalance around 178 tons of CO2in its 30-yearlife? That’s equivalent to 10 football fields covered in trees! On the other hand, most of our current energy is dependent on oil and coal which contribute to global warming. So, instead of burning fossil fuels that are not only quickly diminishing, but also destroying the ozone layer, switch to solar. Solar power is a renewable source of energy, it doesn’t harm the environment and is already all around us just waiting to be harnessed. Many people are shocked when they hear the price of an average solar system and promptly give up on the idea. However, what they don’t know is the huge energy savings they will experience in the future thanks to their investment. For instance, anaveragesolar panel system owner saves anywhere from $40 to $180 per month or an amazing$500 to $2,200 per year. This means your system might pay for itself in as little as five years (if you opt for the cheapest system). For instance, a contemporary 5kw solar systemproduces 20kWh daily to your home (as an annual average), which equals up to $2000 worth of power savings per year. They also look pretty elegant on your roof and don’t compromise your lifestyle either. In order to reach your house, electricity needs to travel a long way from power plants via complicated and big networks of paths. However, long-distancetransmission usually brings substantial power loss. On the other hand, solar panels are installed directly onto your house which boostselectricity efficiency since the distance it has to travel is so short. Your energy is now domesticated and you can have better control of your utility bills and energy usage. Plus, modern solar panels are very durable, so energy loss due to malfunction is quite rare. Thanks to your solar system, you can be more independent from expensive energy providers in your area. Just in the last few years, most countries experienced an increase in residential electricity priceswith bills in some states and parts of the world literally skyrocketing. Unlike your local providers, the sun will never increase its prices—sunshine is always free and widely available. So, if you don’t like all the freedom your providers have when it comes to energy rates, you might consider switching to solar. In some cases, if you collect too much energy, you can even sell energy to your provider. The sun can be a key component of achieving energy independence of your country. If you increase the capacity to generate electricity from renewable sources, you can help yourcountry stay safe from price fluctuations on the global energy market. Fossil fuels will eventually run out, generators can break and utility companies can stop doing business with you. Meanwhile, the Sun will continue to shower the Earth with its energy for free! Actually, every second the Earth is hit with four million tons of raw energy while we need only .0001% of that number to keep our homes and factories running! When you look at it that way, you never need to worry about running out of energy if you provide your home with a good solar power system. Blackouts and brownouts are mostly experienced due to overload on demand in the power grid. So, if more of us switch to solar (every home with a solarsystem is a mini power plant), our energy providers can breathe more easily. This ensures greater grid security and more illuminated homes in case of a disaster. Modern solar energy systems require very little maintenance. Keeping them relatively clean is all you need to do, so make sure to wash them a few times a year—that will do the job. Additionally, solar panels have no moving parts, so you can expect no wear and tear, except with the inverter. This part should be changed every 5 to 10 yearsbecause it’s constantly converting solar energy into electricity and heat. Apart from that, your cables might require checking up every few years if you want to ensure maximum efficiency. All the best systems have a long warranty, so if you experience any issues, call the pros! The solar industry is growing very quickly and is creating jobs at a quick rate. This growth is expected to continue with its growth in upcoming years and open up many new job opportunities of experts and labourers. Solar-related jobs are well paid and they can be a significant contributor to your country’s economy. Today’s solar energy systems look amazing when installed on modern houses and add to their contemporary and chic vibe. Even older homes can benefit from solar panels. They are a great way to break the overly rustic design and give your home an attractive focal point. All in all, investing in solar power means investing in future. So, if you’re considering whether to equip your new house with solarpanels, we say go for it! We publish tons of general real estate information as well as really cool luxury properties from all around the US.